It's funny how things come about. Stephanie Darling, Madison magazine's beauty & living director, contacted me about my blog, and she had some questions. Of course, I was more than happy to help. 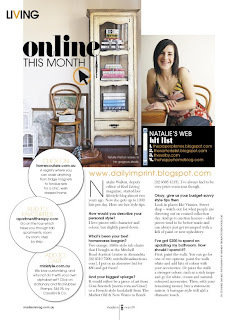 After all, writing about decorating is something I do everyday for real living magazine. But afterwards I wasn't quite sure where these answers were going, so I asked. In the mag, it turns out. Oh. Wow. Really?! Needless to say, I was very excited and so rushed out and bought a copy yesterday - which, you all MUST do - hehe. (It really is my fave issue in ages - I'm so head-over-heels in love with the Gucci look on page 43.) Seriously, though, I'm super flattered because it's the first time I've been in a print publication for something I'm doing. Usually I'm profiling other people. It really is wonderful to be on the other side of the fence for a change. Thank you, Madison! Congrats Nat. That's very exciting and very well deserved. Oh, Shannon. That's so sweet of you. Thank you. And I hope you're having a wonderful birthday adventure!